We spend a third of our lives sleeping. Choosing the right bed can feel like learning a new language. The tons of options and materials can leave you feeling drained and overwhelmed. The bed is the focal point of your bedroom. Getting it right is the most crucial step to have you functioning as a power horse. Want to feel like royalty? Get yourself a sleigh bed. This guide takes you through what a sleigh bed is, where to buy your ideal sleigh bed and the key features to consider when shopping for your best sleigh bed. As the name suggests, a sleigh bed initially known as a French bed is a bed that resembles a sled or a sleigh. What makes it stand out from the other beds? It's curved or scrolled foot and headboards which are slightly raised than regular beds. The original concept of the sleigh bed was by the French and American Empire period in the early 19th century. The headboard is larger than the footboard giving it a cosy feel — both pieces curve upwards and outwards like a sleigh. The curved design provides greater space to snooze off, and there is minimal chance to bump your head against the bed frame. Most sleigh beds are made of wood and are quite heavy. You can have either solid or panelled boards with traditional or contemporary designs. Wayfair offers a vibrant selection of sleigh beds you’ll absolutely fall in love with. The best part is that you enjoy free shipping when you get to buy the best sleigh beds on their site. Amazon is arguably the largest online shopping store with a wide variety of highly-rated sleigh beds. 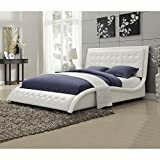 Get elegant top-quality designs at suitable prices with tons of brands offering single, twin, king and queen size sleigh beds. Shop a huge variety of sleigh beds at eBay. If you have a taste for vintage or antique designs eBay is your best go-to site. You get a rich variety of sleigh beds at affordable prices. You also get to bid on second-hand beds for as low as $30. You get to shop a great selection of different sleigh beds designs from leather to upholstery and wooden bed frames from top quality brands. Walmart also has sleigh beds fit for your little one at reduced prices. Bed frames also known as bedsteads support the mattress and the sleeper’s weight. They are made of wood, metal, upholstery or leather. Wood and metal frames are the most popular. Read our short guide to find out which one gives you a bang for your buck? Metal takes up less space making it suitable for small and stuffier rooms. It is sturdy, lightweight, and affordable and requires little maintenance. You can mold it effortlessly into different shapes and designs. Wooden bed frames are versatile and come in different forms such as mahogany, pine, walnut or oak. You get a warm earthy and natural feel to your bedroom. The slats that run across the width of the bed provide extra support. With wooden frames, you can recreate unique and beautiful designs by staining, sanding or painting to refresh its outlook. Wooden frames are more durable than metal frames. They are more expensive and difficult to assemble, but it’s worth the effort. Wood is perfect for big rooms and grand designs. It's heavy making it quite difficult to manoeuvre around. Wood is susceptible to fire damage, water damage, and pest damage, unlike metal. Can a Headboard Style become a Deal-breaker for a Sleigh Bed Lover? The style and look of a sleigh bed are in its headboard and footboard. The headboard is the most dominant feature of a sleigh bed and is the focal point of the bedroom. The unique arched design gives the sleigh bed its name. The headboard design will influence the sale of the sleigh bed. Most buyers are on the lookout for the curved design when purchasing a sleigh bed. The difference between a good design and a great design that matches the customer’s preferences is a huge deal breaker for the sleigh bed lover. What should be the Height of the Mattress on a Sleigh Platform? Sleigh bed mattresses come in varying heights from as low as 5 inches to as high as 20 inches. There is no one ideal mattress height for all sleigh beds. Both the footboard and headboard are significant determiners of the mattress height. Sleigh beds with low footboards usually require a mattress that matches the height for a proportional look. The mattress should not exceed the height of the footboard to avoid overshadowing the headboard. An 8-inch mattress is ideal for this height. You can use either low or high profile mattresses for sleigh beds with no footboards. Chalet style has a better chance of pulling off the top mattress. They are usually not that cocooned that allow users to enjoy the mattress thickness without worrying. Chalet-style sleigh bed size features high curved headboards and footboards. Because of their height, they require deeper, high profile mattresses with an oversized look. Do I need a Box Spring or Foundation with Sleigh Bed? Choosing a box spring or foundation for your sleigh bed is a personal choice. Most sleigh beds are huge, and a box foundation holds the mattress in place. Most sleigh beds feature a slatted system that reduces an uneven surface and minimizes mold and dirt build up which is familiar with box springs. The built-in wood slats make the bed breathable and create an even surface for your mattress to sit on. The box spring is not necessary; it will just add extra weight and height on your bed.